Texas Sriracha Steak Street Tacos. A glaze of Texas Sriracha Sauce adds a little bit of heat, and a little bit of sweet to street-style tacos. I have been compensated and provided with product by Stubbs Legendary Bar-B-Q sauces for this article. My opinions are my own. Eaten by hand, and devoured while standing in front of the truck, or taco stand, from which they were purchased, street tacos are simple on ingredients and big on flavor. The first time I had them was in Tucson. Our son drove us over to a part of town we had never visited and we purchased grilled Carne Asada Tacos from a tiny taqueria. Hands down the best taco I’ve ever tangoed with. This is where I learned that there’s more in life than the Tex-Mex taco I had grown up with. Soft corn shells, cilantro, sweet crisp raw onion, perhaps fresh home made spicy salsa and grilled, stewed or fried meat all make a regular appearance in Mexican-style tacos. And you bet, it’s all about the meat. Stewed, braised, fried or grilled, the flavor comes from a great marinade combo that seems to always includes lime juice. Thanks so Stubbs and some street style tacos inspiration for my latest version of home-made street tacos. My meat counter had a fabulous looking piece of flap steak that I grabbed up pronto. Flap is similar to skirt of flank steak, very flavorful and finely textured. A tad chewy, you should marinate before grilling or roasting. Using my go-to recipe for an overnight marinade, I fired up the grill to 500 degrees and then lowered it to 400. I grilled the flap meat for about five minutes per side with a result that included some beautiful grill marks. That’s where Stubbs bigger than life Texas Sriracha Anytime Sauce came in for the kill. A flavor-packed blend of chile peppers, garlic and cane sugar make this sauce oh so spicy with just a little bit of sweet. With my silicone brush, I generously slathered the meat with the Texas Sriracha Sauce and immediately turned the steak so the sauce side was on the heat. I let it cook for a couple of minutes while brushing the top side with more of the sauce. I turned it one more time for one more quick glaze. It looked just like I wanted it to. Letting it rest before slicing the flap meat against the grain, I thought it was cooked just right for us. And the flavor? Wow! Perfect to build those steak tacos. Keeping the taco ingredients simple with crumbled Cotija cheese, a slice of avocado and some cilantro, let the flavors of the meat shine. Looking for a side dish? Take a look at our favorite Mexican Rice recipe. Combine jalapeño, garlic, cilantro, lime juice, oil, salt, pepper, and cumin in a large resealable bag or bowl. Add steak and toss to coat; if using bowl, wrap with plastic. Marinate in refrigerator overnight in refrigerator, tossing occasionally. 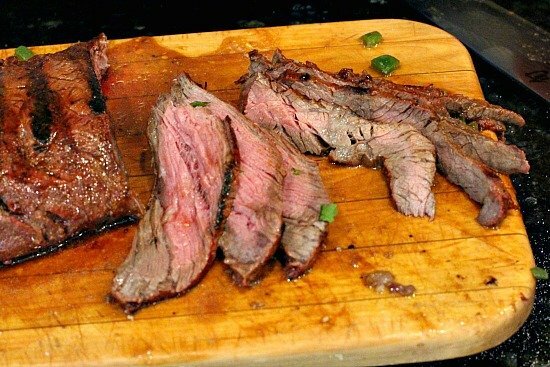 Bring meat to room temperature by removing from refrigerator for about an hour. Heat grill to 500 degrees and then lower to 400. 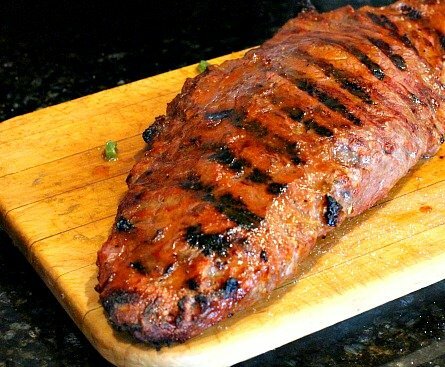 Remove steak from marinade and grill about 4 minutes per side (depending on thickness) for medium rare. Generously brush the meat with the Texas Sriracha Sauce and turn the steak, sauce side down so the sauce will glaze. Only let this cook for about a minute. While the underside is glazing, generously brush the up-side of the steak with the sauce. Turn and repeat. Remove the steak and let it rest 10 minutes under foil before thinly slicing against the grain. 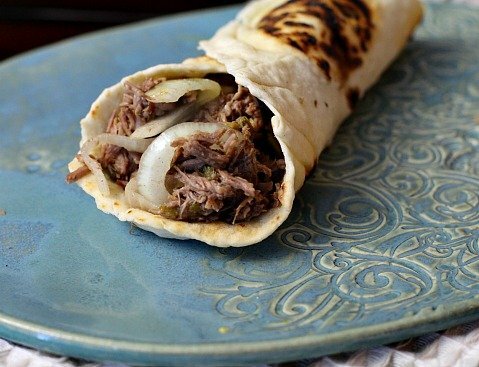 While the meat is resting warm tortillas in a microwave oven. Dampen a clean dish towel and wrap the tortillas inside. Place the package in a gallon sized plastic storage bag and place in microwave, without sealing the bag. Cook for 4 minutes on 50% power. Tortillas will stay steamy in the microwave until you're ready to use them. Divide steak among tortillas, then build with toppings. 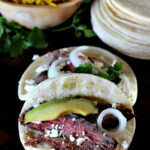 Texas Steak Tacos … They’re what’s for Dinner. Thanks to Stubbs for sponsoring my post. Stubbs authentic sauces, rubs and marinades get their bold flavors from real ingredients, with no artificial flavors, colors or sweeteners, or high fructose corn syrup. July is National Grilling Month and they offers a variety of rubs, sauces and marinades to help kick off the season and move the cooking outdoors. Looks beautiful. And because I know how divine Stubb’s Texas Sriracha really is — I have a serious hankering. Wonderful stuff! I’ve loved every single product that they’ve sent me. Great company and great flavors. OK. I meant to mark that recipe with a 5-star.. Damn Interweb and it’s freaking pauses! Looks and sounds delicious and I really like the meat shot. Since we’re heading for Tuscon this winter, I’d like to know the name of the taco place. Give me a good street taco anytime. I am glad to see them on menus now, even at Tex-Mex places. Love, love, love sriracha! Me too – on all accounts. Tacos are where it’s at! How much marinade did you use? These look great! I don’t know. Just a good old slather. Hope that helps. Wow, these look great! Love tacos of any kind, but street tacos are the best. Simple and such direct flavors. Terrific post — thanks. I saw this pop up in my feed and made a mental note to come over and look. Yum! They look fantastic. I’m a Stubbs fan, but I don’t think I’ve tried the siracha version. I’ll fix that problem this weekend! Well the next best thing to being in Tucson (well, maybe not until fall) would be making these at home. 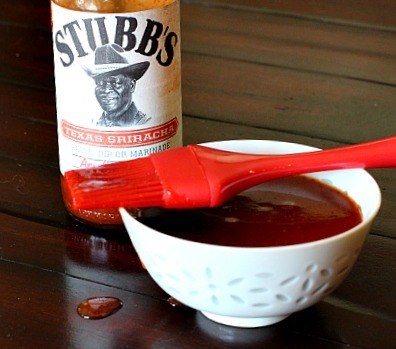 I haven’t tried that variety of Stubbs sauce but it sounds wonderful! Great looking tacos, Lea Ann! Lea Ann, I love everything about this recipe except the Cotija cheese. For some unknown reason, I developed an aversion to it decades ago and still avoid it. I think maybe it was the dry texture of it. 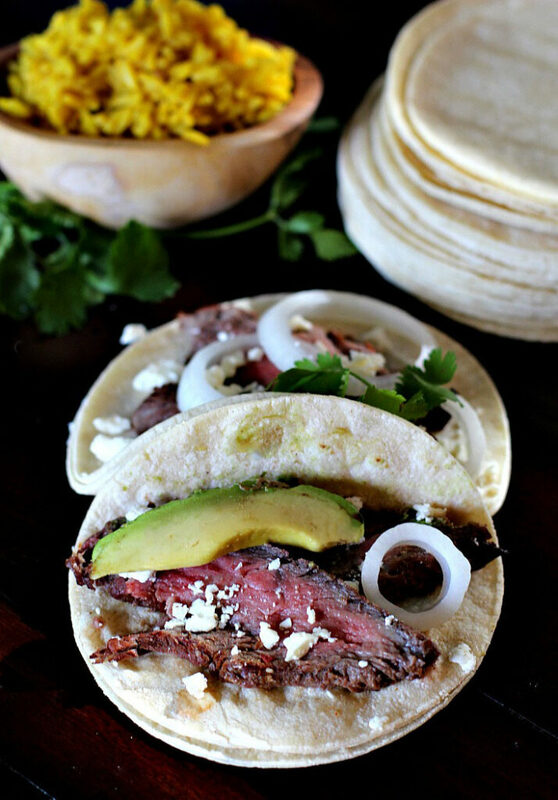 Anyway … that marinade, perfectly done flap steak, white corn tortillas and avocado look like something I want to have on my plate today! I’m sorry to hear about that — and yes, it’s dry. There are other Mexican cheeses that are not so much. Hi Lea Ann, my daughter and her family live in Tucson and they took me to a similar place, wonder if it is the same one. Love, love these tacos, they are perfection. I’ll have to find out the name and area and let you know. Larry wants to know also.